The Confederation of British Industry estimates that the average direct cost of absence is £531 per employee and the projected direct cost of staff absence across the UK economy is estimated at £13.2bn per year. As meeting the cost of sickness absence has moved away from the taxpayer directly to the employer there has been increasing emphasis on introducing robust attendance management policies. Research indicates that short-term absence may be perceived as more prevalent than long-term, but longer periods of absence can account for up to 75% of the total costs.2 And long-term absence has significant financial consequences for all employers whether large or small, due to both direct and indirect replacement costs and reduction in productivity. Workplace rehabilitation programmes often involve early referral to specialists such as occupational health, physiotherapy or counselling services, as well as the provision of modified work for staff who are returning to work following a period of long-term sickness absence. Modified work normally involves temporary changes in the duties, hours or expectations of their job, until the employee is fit to resume normal duties. 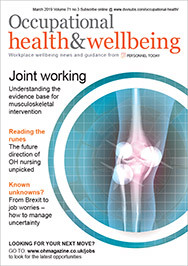 Occupational health professionals are aware that return to work processes are not simply about health or medical issues but also involve a social process that depends on organisational policies and culture as well as stakeholder and employee commitment. Additionally, the provision of workplace modifications is often influenced by cost implications, the size of the organisation and the variety of jobs available. However, this research was mainly undertaken in Australia, North America and Scandinavian countries, where the law is significantly different to UK legislation relating to occupational rehabilitation. In those countries there is a legal requirement for all employers with more than 20 staff to have rehabilitation policies and procedures that must be implemented when an employee has been absent due to sickness for more than four weeks. A large survey of 160 UK employers carried out in 2001 found that two-thirds of the organisations had a written policy that mentioned return to work issues, mostly within attendance management policies.8 These policies may only give a few lines or pay ‘lip service’ to rehabilitation, and were normally about work modifications that had been recommended by OH. Phased return on reduced hours. Stakeholders, such as managers, co-workers and employees, are likely to have different motivations in relation to rehabilitative procedures and this can lead to conflict and resentment between key parties. Much of the literature had common themes which contribute to the effectiveness of rehabilitation processes and equally common barriers to successful implementation (see table above). Additionally, most of the research surrounding long-term absence and rehabilitation measures is taken from the employer perspective, mainly from human resource professionals and senior managers. There is limited empirical research involving employee attitudes to the perceived effectiveness of return-to-work programmes. I carried out primary research involving both employee and employer attitudes, relating to the implementation and effectiveness of attendance management and workplace rehabilitation procedures in three NHS trusts in Northern Ireland – Health and Personal Social Services (HPSS) trusts. The research involved an anonymous postal survey across the three HPSS trusts, of 660 (1:2 random sample) employees who had returned to work following a period of long-term sickness absence within the calendar year February 2005 to February 2006. The employee survey was then followed by in-depth interviews with six managers from different directorates (nursing, support services, administration, social care and domiciliary care) across the three organisations. Long-term sickness absence (four weeks and more) accounted for 55% to 60% of the total level of absence in each of the HPSS organisations involved in the research. On examining the profile of all the employees who had returned to work following a period of long-term absence (1,320 employees) within the designated calendar year, 60-70% were absent for between one and three months. The results from the employee survey indicated that those absent for this length of time received the lowest levels of work-based support and rehabilitation. Some employees and managers also felt that sickness absence was not really perceived as long-term until after eight to 12 weeks, although the attendance management policies all clearly stated procedures for long-term absence must be implemented at four weeks. The postal questionnaire received a response rate of 43% (283 employees) and the respondents were representative of the total population profile in terms of age, length of absence and occupational group. In line with other research, stress and musculoskeletal disorders were the most frequently indicated reasons for absence. Like many organisations, all three trusts have taken steps to address these issues through fast-track referral to OH, physiotherapy and counselling services. Correspondingly, those who were absent from work due to mental health and musculoskeletal disorders had been offered the highest level of rehabilitation changes to facilitate their return to work. Importantly, long-term absence relating to post-surgery, post-natal debility and joint problems (including fractures) were also significant, but this group of staff had been offered much lower levels of rehabilitative changes. It is therefore important for managers to ensure that employees who are absent with problems not related to mental health or musculoskeletal disorders should also be offered rehabilitative procedures where appropriate. The employees were asked in the questionnaire what, if any, support measures they had received during their period of absence. Seventy-two per cent of those who had been absent for between one and three months were not referred to OH, despite absence policies stating that employees should be referred after four weeks of absence. Most attendance management policies also state that rehabilitative return-to-work should be recommended by OH, yet the largest group of staff on long-term absence (one to three months – 60-70%) were not referred to the OH department. Of the work-based help for returning employees, social support from colleagues was highlighted as the most effective, yet this was often not recognised in attendance management policies. The least effective forms of support were ‘regular contact with managers’ and ‘return-to-work interviews’, despite these both being highlighted in research as essential to the effective management of attendance. This has policy implications for the three organisations, relating to the current methods and delivery styles of important manager interventions. Staff were also asked whether they had been offered any rehabilitative changes to help facilitate an earlier return to work: 48.4% of respondents said they were offered such help, but 51.2% did not have any form of rehabilitative return. Significantly, of the 145 employees not offered a rehabilitative return to work, 114 (78.6%) were absent for between one and three months. Of the 48.4% of employees (138) who did have some form of rehabilitative return to work, 60% used their outstanding annual leave to reduce their hours temporarily, and more than 30% had temporarily reduced hours. Interestingly, managers and employees pointed out that there could be some negative connotations with rehabilitative procedures. For example, it is important that temporarily reduced hours should also be reflected in a corresponding reduction in workload, yet some staff indicated that they had been expected to carry out their normal workload in fewer hours – which was actually detrimental to their recovery and their long-term health and wellbeing. Significantly, only 6.4% of the employees offered rehabilitative measures were offered temporary restricted duties – in contrast to the evidence that the provision of suitable modified duties is the cornerstone of effective occupational rehabilitation. Correspondingly, managers indicated during the qualitative interviews that they could facilitate temporary reduced hours but found it difficult and were often reluctant to accommodate temporarily restricted duties, as they felt that this placed undue pressure on existing staff and could cause conflict within teams. Additionally, managers felt it was difficult to offer restricted duties to groups of staff doing manual work. All aspects of rehabilitative return were shown to be ‘very effective’ or ‘effective’, the most statistically significant being temporarily reduced hours and duties. A pivotal element of the questionnaire asked employees if they believed that the rehabilitative changes had facilitated an earlier return to full-time duties. Significantly, 69% of employees ‘strongly agreed’ or ‘agreed’ that they had. Yet in stark contrast, the managers did not feel that rehabilitative return-to-work initiatives actually reduced the length of absence. They felt that the length of absence was directly related to the generous terms and conditions of employment and although rehabilitation presented a positive caring image for the organisation, it did not reduce the length of long-term sickness absence. Finally, the questionnaire highlighted that there was a significant lack of awareness among all occupational groups (68%) about workplace rehabilitative procedures. Poor communication and common purpose among key stakeholders. It is important for key stakeholders, including senior management and OH to examine the profile of sickness absence in their organisations. For example, within this study 60-70% of the total long-term absence was for between one and three months and management should ensure that organisational policy and procedures adequately address these issues. There is a need to recognise and address cultural attitudes to rehabilitation among staff and managers. Managers play an essential role in the successful management of sickness absence, including occupational rehabilitation. Senior management and line managers need to champion rehabilitative procedures before full benefits can be realised. The greatest barriers to achieving improved return-to-work outcomes often exist within the workplace. If rehabilitation procedures are to succeed in reducing the length and costs of sickness absence, there must be increased awareness, commitment and improved communication among all stakeholders, including HR, managers, OH, absent employees and co-workers. One way of raising the profile could be to introduce a separate rehabilitation policy or increase the emphasis and guidance within existing attendance management policies. Key stakeholders need to be involved in investigating innovative ways to challenge existing problems associated with accommodating temporarily restricted or modified duties, within agreed time limits of four to six weeks. It is also important that rehabilitation procedures such as reduced hours should coincide with reduced workload for that period. Finally, there is a need for further research in occupational rehabilitation to identify best practice in both the public and private sectors and enable organisations to work towards realising the potential benefits of rehabilitative procedures.